to weapons or stores with 14- or 30-inch suspension lugs. The forward hook is held in place by a quick-release pin. Eight lifting eyes allow you to handle weapons with different centers of gravity. Before you attach the carrier to the load, put the adjustable hook in the appropriate suspension placement hole, which is held in place by a quick-release pin. With the spring-loaded latch unpinned and depressed, the carrier hooks are engaged with the weapon lugs. Release the spring-loaded latch and pin the latch in place with a quick-release pin to secure the load. An instruction plate, mounted on the carrier, makes it easier for you to match the correct lifting eye to the load. The Mk 51 Mod 1 weapons carrier is used for horizontal lifting. It has an SWL of 4,000 pounds. REVIEW NUMBER 2 Q1. What is the purpose of a carrier? Q2. The Mk 49 Mod 1 weapons carrier is constructed of ________________________. Q3. The Mk 49 Mod 1 and Mk 51 Mod 1 weapons carriers are used to ________________. Q4. What is the SWL of the Mk 51 Mod 1 weapons carrier? STANDS LEARNING OBJECTIVE: Recognize the purpose and use of stands to include the A/E32M-4 maintenance and reconfiguration stand, the A/F 32K-1/1A bomb assembly stand, and the A/F32K-10 small bomb assembly platform stand. Stands are metal frameworks used to support a weapon that is being assembled or maintained. Stands may be immobile or equipped with pivoting casters. The stands discussed in the following paragraphs are of the immobile type. A/E32M-4 MAINTENANCE AND RECONFIGURATION STAND The A/E32M-4 maintenance and reconfiguration stand (fig. 9-9) is made of steel and aluminum. The stand consists of maintenance ring assemblies MXK-663/E32M-4 (forward), MXK-664/E32M-4 (aft), and deck post assembly MXK-665/E32K-4 that supports each ring assembly. The ring assemblies can be rotated 180 degrees for convenient load accessibility. The A/E32M-4 maintenance and reconfiguration stand is used to hold the F-14 aircraft weapons rail during general maintenance. It is also used for configuring the F-14 weapons rail with associated bomb racks. REVIEW NUMBER 1 ANSWERS A1. For a complete listing and description of approved handling equipment, you should refer to NAVSEA OP 2173, Volume 1. A2. The general purpose of the standard four-way wood pallet is for use when shipping domestic unit loads of ordnance. A3. The safe working load (SWL) of the Mk 3 Mod 0 and Mk 12 Mod 2 pallets is 4,000 pounds. A4. Ammunition pallet crates are used at naval shore activities to handle loose ammunition and inert items during on-station handling and transportation. REVIEW NUMBER 2 ANSWERS A1. 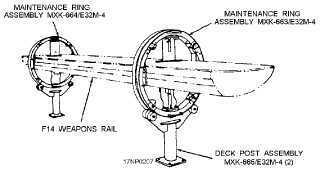 A carrier is used as a quick and safe way of attaching a crane cable or other hoisting device to ammunition for movement from one area to another. A2. The Mk 49 Mod 1 weapons carrier is constructed of two steel pallets welded together. A3. The Mk 49 Mod 1 and Mk 51 Mod 1 weapons carriers are used to lift weapons with 14-inch suspension lugs. The Mk 51 Mod 1 carrier can also lift weapons with 30-inch suspension lugs. 9-5 Figure 9-9.A/E32M-4 maintenance and reconfiguration stand.